Did the wrong people accept the risk? After reading Robert X. Cringely’s post on the oil spill, I felt obliged to comment. I feel the biggest problem with the whole oil leak catastrophe is that the wrong people were accepting the risk. Here is my comment that I posted to Robert’s blog. Every project that has some likelihood of endangering life or property needs to be prepared for the worst case, or even the worse worse case. I think that it might well be that what is happening in the Gulf at the moment isn’t the worse. I can imagine say an earthquake-induced fissure could unleash oil at maybe 10 times the current flow rate. But is anyone expecting that – probably not. I imagine since we started drilling for oil or gas, millions of wells have gone in. Maybe only dozens have had a problem within an order or two of magnitude of the problem. But clearly the probability of such an incident as we have was never going to be zero. Somewhere, someone (probably many times) would have considered the scenario we have, and probably outlined the consequences. And while some measures seem to be used in oil-drilling (such as the infamous BOP), clearly it doesn’t mitigate all possible scenarios. So what happened? Simply put, the risk was accepted. We accept risk all the time. Every time I drive to work, I accept the risk that if one of my front wheel falls off through mechanical fatigue, I will likely die. I can imagine that car builders could have mitigated this by making the wheel twice as strong, or maybe adding redundant front wheels. Wheels have detached on cars so this isn’t an unknown scenario. However the manufacturers, and to a greater extent the drivers accept this risk, as the cost of mitigation is too high to be affordable, and the probability of it eventuating is small even though the impact is large. The same goes for flying in commercial aircraft. I am sure they could build planes with an exit door on every row, and we all wear parachutes. We all could be trained to use these, obtaining an air passenger licence before we fly. I imagine this might have been considered in the past, but it will never be implemented. Partly this is due to the fact it only mitigates against some failures, that parachuting is risky in itself, and the cost and complexity of implementing it would be mean flying as we do today would just not happen. So we accept the risk. Posted on June 13, 2010 June 13, 2010 Categories UncategorizedTags gulf oil leak diyLeave a comment on Did the wrong people accept the risk? I just saw the news that the “top kill” method to stop Gulf of Mexico oil well leak has failed. I tweeted yesterday that I thought it had the same chance of success of using Blu-Tack (or chewing gum) to fix a radiator leak. While it might stem the flow for a little while, inevitable the fluid under pressure is going to find fissures and capillaries to follow and eventually hydraulicly lift the intended seal away from the surface. However, I feel all is not lost. I regularly need to get anchorage on difficult surfaces. I am talking about mounting shelves on plasterboard (drywall) or bolting brackets to brick or concrete. To do this you can use various proprietary wall anchors. 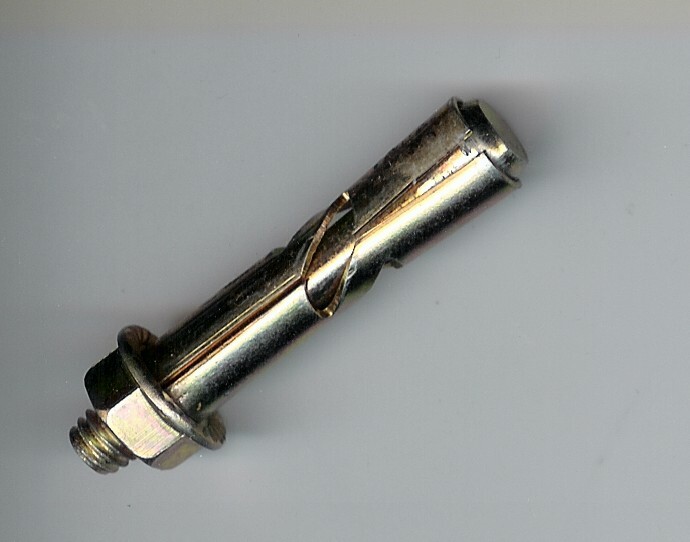 Almost all of these use some sort expanding material (plastic or metal) such that when a screw or bolt is turned, the device expands outwards into the wall. This is using basic mechanical principles of an inclined plane and/or lever. The screw of course is a inclined plane wrapped around a cylinder, and often there is two others working as wedges that expand, or some use levers in an umbrella like fashion to expand. The anchor is held fast through shear friction against the wall you are attaching to. You can also create an expanding surface using fluid pressure. This is done in a clinical stent that is used to temporarily or permanently hold arteries or other ducts open. Some use a balloon that expands up air pressure, or some are mechanical similar to a wall anchor. Another example is the sanding band I have for my rotary tool. 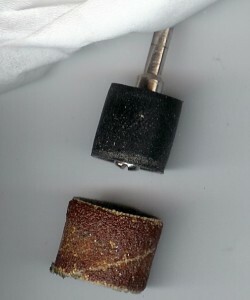 It uses a screw to expand a rubber grip, which holds on to the band. Either way, I don’t see why such a device, suitably encompassed by say a rubber sheath, could not be inserted in the well, expanded to hold fast on the wall, and the sheath would stem much of the leak. Even if it isn’t a total seal, I imagine you could gaurantee the porosity could be well less than 10mm or so. You could then pump “mud” or what have you through this anchor, into the well to stem the flow further. This stent/wall anchor would push against the sides and rely on pressure to hold it in. It could be driven either via hydraulic motors or rams to create the necessary leverage, akin to me turning the screw on my wall anchor. (A balloon stent mechanism might also work but there maybe issues of expanding a balloon 1500m below the sea). I imagine the well bore is lined with a metal casing. There is of course a risk that the whole casing might be pulled out as the gas/oil pressure pushes against the wall anchor or seal. But I guess there is nothing stopping you inserting another anchor, if it is blown out, which can be driven against the natural earth wall left once the casing is removed. (You could even have a mechanism to drive horizontal spikes out of the anchor to get a more positive grip). Yes there are obvious issues of working robotically at such pressures. Also the stent/wall anchor needs to be designed and built and tested to work under the needed forces. I’m not sure the state of the top of the well now, but clearly any valves or the like need to be removed, to leave a clean hole to insert the anchor/seal. My sketch below shows the 4 steps needed. I have added a more deailed diagram below showing how the stent/anchor would operate. The hydraulic motor would drive the shaft. It would be threaded with left and right-hand threads. 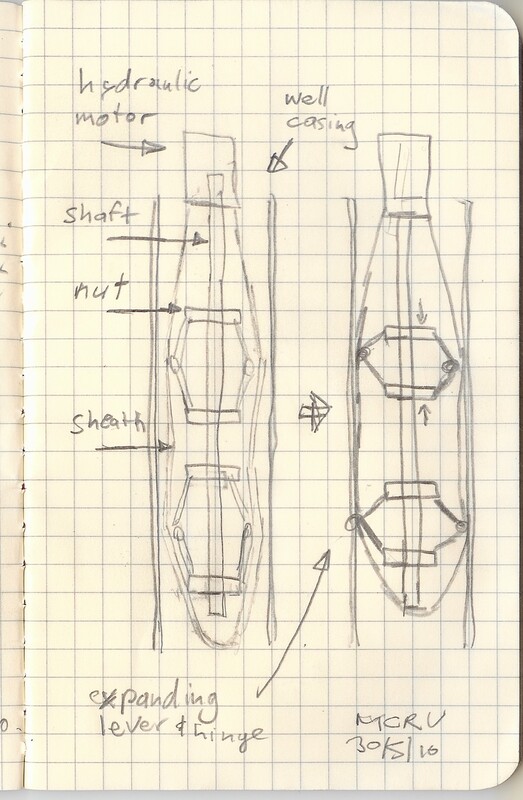 This way a rotation of the shaft would drive the nuts towards each other in pairs. (This is the same as how turnbuckles operate). The lever and hinge arrangement connected to the nut pairs would cause expansion of the sheath sealing the shaft. The head of the device might be complete sealed. 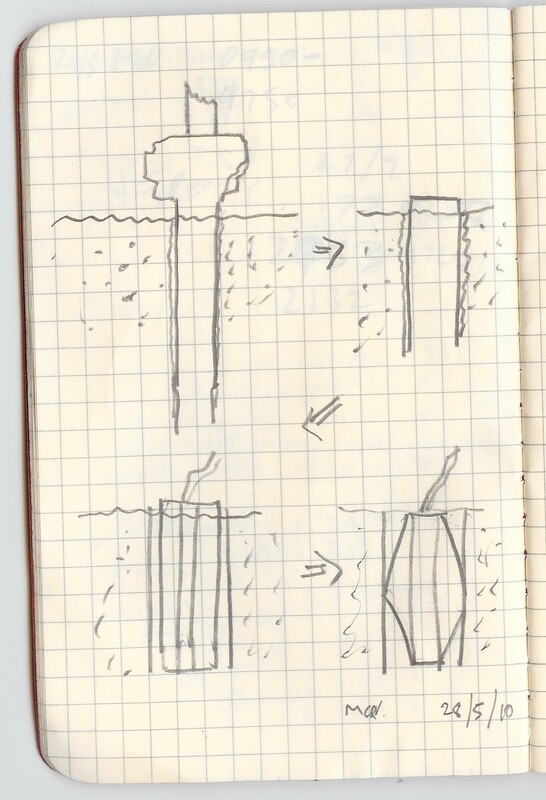 The shaft could also be hollow to allow pumping of mud to properly seal the well. Which helicopter would you rather be driving? Posted on March 2, 2009 February 28, 2010 Categories photography, funLeave a comment on Which helicopter would you rather be driving? I’m not quite sure of the marketing angle here. I’ve seen power pole posters used to “buy a 4 bedroom homes with quick transaction!”, “lose 30kgs in 4 weeks”, and promote “swedish tribute band – BAABAA”. 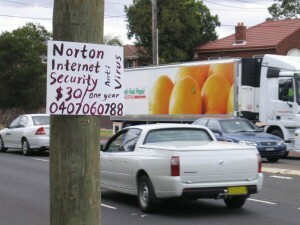 But trying to flog Windows anti-virus software from the roadside is a first. Maybe they’re trying to home in on a niche customer base that I am not aware of. I have to admit that I dubious of the integrity of software that is bought from someone who advertises with hand-painted posters as if it is a garage sale. Maybe it is all legit, though I have my doubts when the recommended retail price at Symantec is $99.99 and this can be had for a bargain at $30. I imagine Symantec don’t normally offer such deep discounts to their resellers. (And I am also assuming that this guy isn’t just selling a one-off unwanted licence). Disclaimer: I have not contacted the seller, hence I am only giving my opinion on this advertisement. If you do follow through and make a purchase from them, don’t hold me responsible as to the software’s efficacy or otherwise. A short holiday read – and an insight into me. Around 1993 was probably a big turning point in my career life. Up until then I had spent a lot of time involved in designing and implementing solutions around process control systems at the Port Kembla Steelworks. When I graduated (in 1985) I was doing straight electrical control work as well as some PLC (programmable logic control systems work). A few years later I was writing FORTRAN code than allowed operators to control big machines (such as plate mills and cranes). I became fascinated with communications and networking, and started doing work in that front in the late 80’s, a lot of this was around the low-level communications between process control computers, but also more general networking like DECnet. I got introduced into UNIX and C in the early 90’s, both doing some communications driver coding as well as X11 based operator interfaces. I bought my first PC for home in 1993 and made sure it could run Windows 3.1 and Linux (SLS, which later begat Slackware, on around 30 floppies was my first distro). I had BBS access and the ‘net soon enough as well. I guess, just like today, I was always reading about new things, and at least having a bit of a play at making things work. One thing I had a little play with at the time was VRML, which is a 3D markup language. At work we also started using the Internet tools a lot. Also the new engineering projects were all being done in CAD, some in 3D, with intent on being better able to plan all the services required on such huge mechanical and civil works. I was also a big fan of raytracing, particularly POVray. Anyway, I saw all this coming together, potentially a huge aid to engineering support. I was starting to becoming more focussed on IP, ATM and other network protocols so it probably was almost farewell to process control world. So I wrote the following short-story in 1993. The chief electrical engineer at the time loved it, and it appeared in the departmental newsletter. I think it was quite well received, though it is probably the first and only short story I have had published. I have made a few small edits from the original, mainly to make it a little clearer to non-steelworkers. I hope you like it! Kurt abruptly woke from his doze as the ‘comm indicated that his attention was required. Despite wanting to throw a heavy object at it, he heeded the ringing. “It’s Max, with got a problem at the Finishing Mill again; hyper-axial gamma ray gauge it seems.”. The last thing Kurt wanted to see on the ‘comm screen was Max. Reluctantly, Kurt stepped across his room and donned the VirtEng, and waited for the retinal scan to authorise him. “VirtEng …Goto Port Kembla Finishing Mill” he uttered to the machine. In an instant he felt the familiar experience of floating above this bane of his life. As he pointed his way down, the VirtEng displayed the detail of the 21 stand rolling mill. The physical view of the mill from above always fascinated him despite rather being someplace else. The hundreds of tonnes of metal and motors and hydraulics had to be coordinated to within a micron in microseconds in order to make the steel strip of the correct properties. As he came up level with the end of the mill, his attention was drawn to the pinkish hue of the gamma ray thickness gauge. For years now the VirtEngs had been able to diagnose equipment status, even subtle problems, and give an indicative colour to the components. “Just out of tolerance” he thought as he mused on the problem. “VirtEng … Logical view” he instructed his helmet and the scene before him faded and a conglomeration of blocks and lines appeared. He began walking past the various schematic components of the gauge. Occasionally he would stop at an amplifier or processor and point at the various panels before him. Charts showing the equipment status immediately appeared before him as he pursued a prognosis of the fault. He could also access a history of this component; not just in this gauge, but of course the database was continually fed by input from all the installations in the world. “It must be this proton accumulator” he thought, “I’ll get the Auto-Tric”. After issuing the dispatch, he investigated the software problem that caused the overload. Again each instruction could be removed, visually displaying a history of past values and execution sequences. After tuning a parameter down with a downward wipe of his finger and satisfied with his work, Kurt thought he’d call it a day. Just after he issued the “VirtEng …Physical view” command he made out the shape of the “Auto-tric” trundling down the mill floor. With a PA-481F in the manipulator, the ‘droid electrician approached the gauge and within a minute had the component replaced and tested. Without as much as a nod the robot returned to the Parts Dispatch Terminal from whence it came. As the mill commenced rolling again, Kurt felt comfortable with the soft blue emanating from the gamma gauge, indicating it’s sound health. Just as Kurt turned to depart, his virtual image bumped into the virtual image of the Mill Superintendent. “Thanks for that Kurt, I thought you were on R&R, but I knew you would help us out”. Posted on January 1, 2009 Categories UncategorizedLeave a comment on A short holiday read – and an insight into me.